MSI S100 is a 10-inch Windows tablet with keyboard, for 349 Euros! One retailer in Europe has the MSI S100-012NL up for pre-sale at 349 Euros which includes 64GB storage and the keyboard cover. Perhaps for that price we can excuse the poorly written PR? If you’re happy with 1280×800 resolution, which I suspect many people might not be, and want a super-cheap, lightweight 2-in-1 then take a closer look. We’re hoping the quality is better than that of MSI’s English proof-reading. Source: MSI. Via ZDnet. Pricing via Geizhals. MSI S20 Slider Ultrabook Convertible Finally Available in the U.S.
As MSI isn’t one of the largest computer makers out there, it’s understandable that their new product launches happen over a period of time, and across a number of regions, rather than all at once. A reasonable excuse, we’d say, for the MSI S20 Slider Ultrabook convertible that popped up on our radar many months ago. The unit, which has been slowly made available in the EU region, is finally on sale in the U.S. The MSI S20 is a remarkably elusive device. Chippy tracked it down for a hands-on at CeBIT 2013 this week. 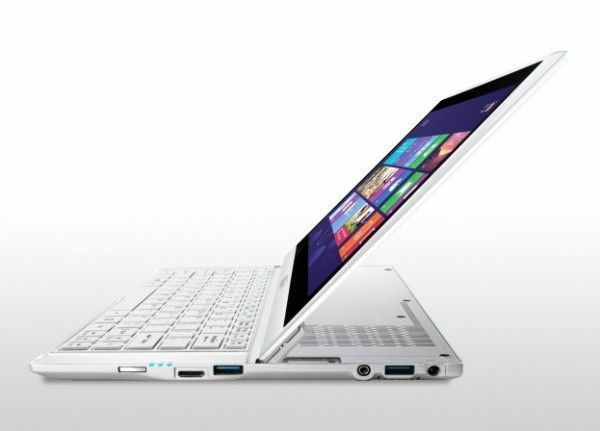 We first learned about this appealing looking Ultrabook convertible 9 months ago — back in June 2012. 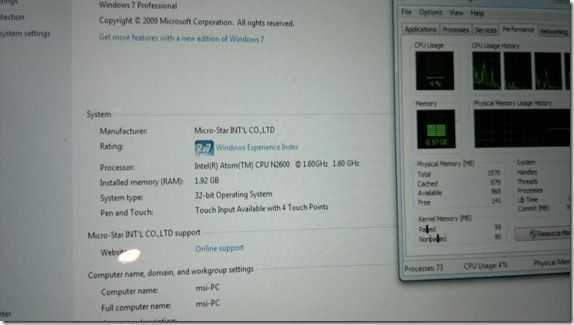 We knew we’d be waiting until at least the launch of Windows 8 in October of 2012 before the official release date, but here we are several months after that and the MSI S20 still isn’t widely available. The MSI S30 is a forthcoming Ultrabook alternative (falling into the more general ‘ultrathin’ category). Though we’ve been eyeing up the 11.6-inch S20 Ultrabook convertible for some time, it looks like the S-series from MSI will consist of both Ultrabook and non-Ultrabook devices. The S30 is a 13.3-inch ultrathin that uses hardware similar to what you’ll find in an Ultrabook, but doesn’t quite fit Intel’s Ultrabook definition — the trade-off being that the S30 will likely be less expensive. 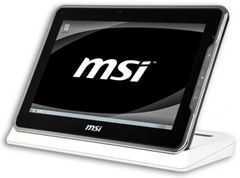 We’ve known about the sleek-looking MSI S20 Ultrabook convertible as far back as June of 2012. 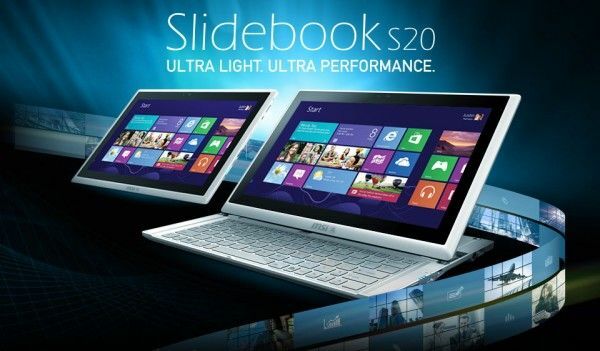 With Windows 8, MSI couldn’t launch the S20 until the official Windows 8 release date on October 26th. But in an Asus-like fashion, MSI left the S20 linger and left any details regarding its release date and price up in the air. Earlier this month, some 7 months after the first announcement, MSI is finally dropping details on when you can get your hands on the S20 Ultrabook and how much it will cost. Additionally we’ve got a fresh gallery of what is likely the final renders of the S20. 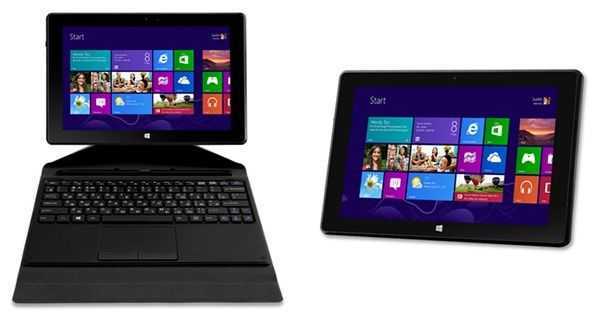 In my regular check of availability for Windows 8 tablets and Ultrabooks I found a couple of interesting new products. The HP Envy X2 and ASUS Vivo Tab are now shipping but these are CloverTrail dockable tablets that won’t really interest anyone looking for desktop-level performance (see UMPCPortal.com for more.) For those looking for some touchscreen Windows 8 mobility with a ‘Core’ inside though, check out the MSI S20 i546 a slider with an 11.6” FullHD screen and a weight of just 1.16KG. Loaded with a Core i5 and 128GB of SSD this little gem is shipping in a number of countries in Europe now. Launch date is obviously going to depend on Windows 8 availability but we’re expecting that to happen without delay in Q4 anyway. As for the price, it seems quite competitive. 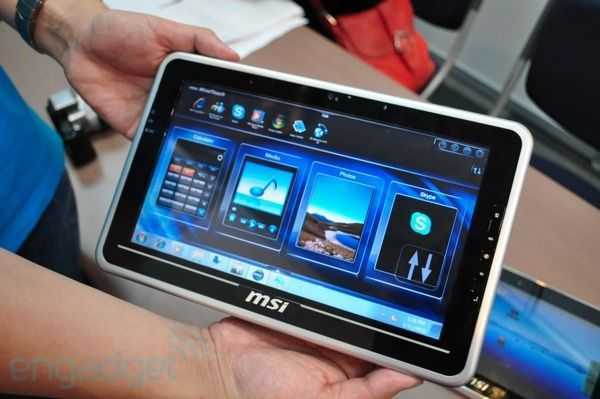 We managed to uncover information about the MSI S20 slider earlier today. We’ve just uncovered the first video of it too! 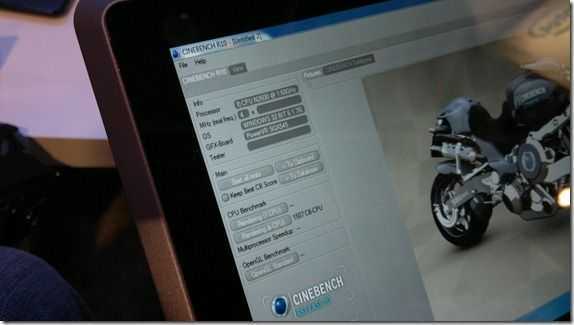 The video reveals USB3.0, 10-point multi-touch, a weight of “less that 2KG”, thickness of less than 1 inch and Bluetooth 4. MSI Windpad U120W. Video Overview, Cedar Trail N2600 Test. 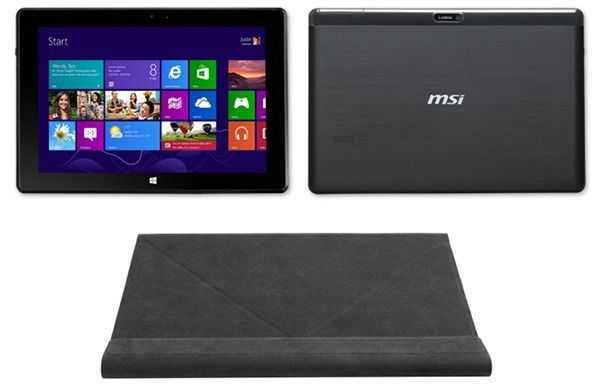 The MSI Windpad 120W is the Cedar Trail version of the Windpad U110W – an AMD Fusion device. We reported on the 120W in June where it showed at IFA with a Cedar Trail 1.86Ghz CPU. We saw it at IDF a few weeks ago and it had a low-power platform inside. We had the chance to give it a few tests. 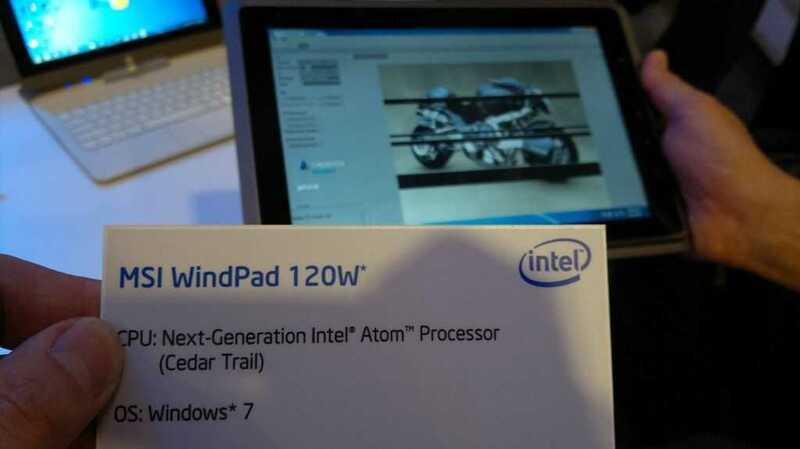 The Windpad 120W shown at IDF used the Intel Atom N2600 with 32nm CedarView-M with dual-core, 2-threads per core (contrary to specs) and 1.6Ghz clockrate. The PowerVR SGX545 graphics operates at 400Mhz and forms part of the GMA graphics unit. The TDP is 3.5W and it is coupled with a communications chip (NM10) that uses 1.5W. We only had time to do some CPU and battery tests but in Cinebench R10 we get a good idea of the CPU performance. A multi-core result of 1507 matches Atom N550 and very closely. And after a good 10-15 minutes of testing, we saw over 4hrs left on the battery (97%) which is an indicator of working time. Given the low TDP of the Cedar Trail platform we expect it to idle down well to add a few hours to that. One thing we still haven’t worked out is the screen resolution although the 110W has 1280×800. If that’s the case, this could make the perfect entry-level Windows 8 tablet. Still outstanding from Cedar Trail tests are definitive 3D graphics performance tests. We’ve seen an indication that the N2800 with the graphics clocked at 650Mhz will be twice as good as the graphics on the Pine Trail generation but remember, the N2600 graphics are clocked lower. Don’t expect anything ground-breaking here. The MSI Windpad is finally available to order in the U.S. (as the Windpad 100W) and in Europe (as the Windpad 232W) and to me it looks like a mish-mash of a Tablet PC that aims to be an all-rounder on specifications and yet ends-up being a master of nothing. The 10 inch screen is 1024×600 â€“ average. 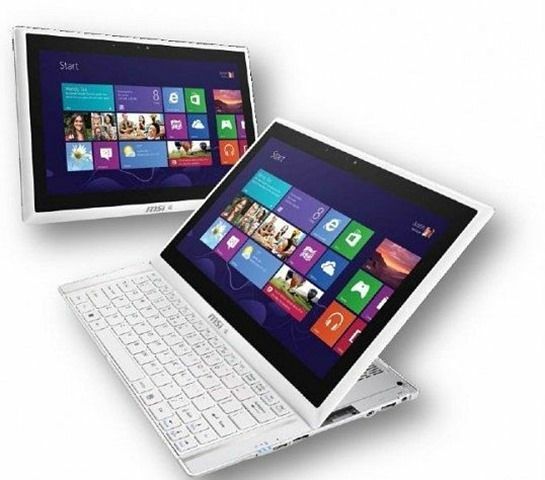 The capacitive screen sits on top of the mouse and pen-focused Windows 7 â€“ Mis-match. The GMA500/1.6Ghz Menlow platform isn’t the best at helping Windows 7 along. An 800gm weight is unlikely to house a battery that offers more than 4 hours. The U.S. version appears to be missing the Bluetooth module. The price isn’t exactly stunning. There’s only one USB port. 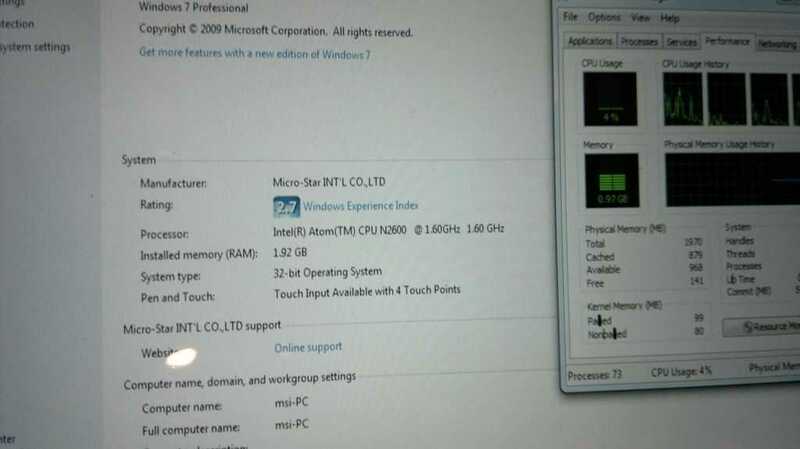 With an SSD, a 1.6Ghz Atom and 2GB of RAM you’d expect it to run reasonably well but Engadget reported from CES that â€œWindows 7 is seriously laggy and unresponsive inch which means it could have a slow SSD set-up inside. The differences in specs between the 100W and 232W are subtle but it looks like the EU gets the more complete tablet package with Windows Home Premium and Bluetooth included in the 232W. Oh, and we’re not sure if that docking station is included too so please check before ordering. Better still, wait for some reviews to filter through first. We’ll add them to the product page when we find them. I’m not a big fan of 10 inch tablets myself but I do know what it makes to create a good mobile TabletPC and a good consumer tablet. The two often require different approaches that can’t be addresses in a single product. That single-product approach is what MSI appear to have attempted here. If the Windpad drops in price, comes with the dock and proves itself through reviews then it might be worth taking a look at as a docked hot-desk solution but for other scenarios, I think there will be better solutions out there. It makes a lot of sense for MSI to wait for the incoming ultra mobile PC platform from Intel rather than launch early with the relatively old Menlow platform and that’s exactly what they’ve gone public about today. MSI WindPad 100 Delayed, Waiting on Oak Trail. Oaktrail isn’t expected until 2011 but it represents quite an important redesign for Intels lowest power windows-compatable computing platform. In summary you can expect about 20% performance increase along with about 20% in-use battery life increase. 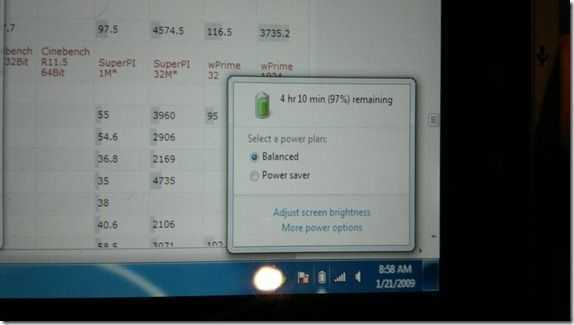 Standby / screen-off battery life should increase by a larger margin. The platform also supports SATA drives and faster memory. More details on Oaktrail here. The Windpad 100 product page has been updated here.